A computer is a complex system consisting of many different components. But at the heart -- or the brain, if you want -- of the computer is a single component that does the actual computing. This is the Central Processing Unit, or CPU. In a modern desktop computer, the CPU is a single "chip" on the order of one square inch in size. The job of the CPU is to execute programs. 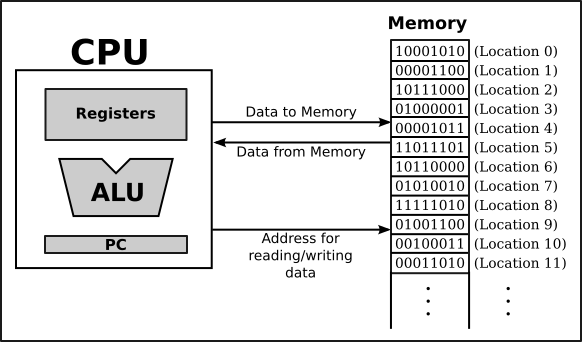 When the CPU executes a program, that program is stored in the computer's main memory (also called the RAM or random access memory). In addition to the program, memory can also hold data that is being used or processed by the program. Main memory consists of a sequence of locations. These locations are numbered, and the sequence number of a location is called its address. An address provides a way of picking out one particular piece of information from among the millions stored in memory. When the CPU needs to access the program instruction or data in a particular location, it sends the address of that information as a signal to the memory; the memory responds by sending back the data contained in the specified location. The CPU can also store information in memory by specifying the information to be stored and the address of the location where it is to be stored. On the level of machine language, the operation of the CPU is fairly straightforward (although it is very complicated in detail). The CPU executes a program that is stored as a sequence of machine language instructions in main memory. It does this by repeatedly reading, or fetching, an instruction from memory and then carrying out, or executing, that instruction. This process -- fetch an instruction, execute it, fetch another instruction, execute it, and so on forever -- is called the fetch-and-execute cycle. With one exception, which will be covered in the next section, this is all that the CPU ever does. A computer executes machine language programs mechanically -- that is without understanding them or thinking about them -- simply because of the way it is physically put together. This is not an easy concept. A computer is a machine built of millions of tiny switches called transistors, which have the property that they can be wired together in such a way that an output from one switch can turn another switch on or off. As a computer computes, these switches turn each other on or off in a pattern determined both by the way they are wired together and by the program that the computer is executing. A computer can work directly with binary numbers because switches can readily represent such numbers: Turn the switch on to represent a one; turn it off to represent a zero. Machine language instructions are stored in memory as patterns of switches turned on or off. When a machine language instruction is loaded into the CPU, all that happens is that certain switches are turned on or off in the pattern that encodes that instruction. The CPU is built to respond to this pattern by executing the instruction it encodes; it does this simply because of the way all the other switches in the CPU are wired together.